This 21-day self-drive tour will take you to see all the places of interest in Namibia and Botswana. The journey will take you from Windhoek to Sossusvlei, Swakopmund and the Etosha National Park before continuing to Botswana via the Caprivi Strip. In Botswana you will join a fly-in safari to the Okavango Delta before you head to the massive salt pans of Makgadigadi. 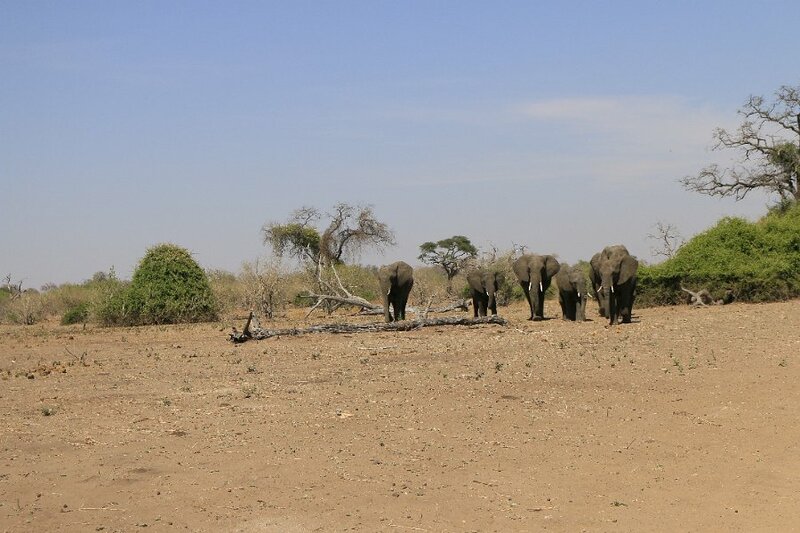 From here your journey takes to the Chobe National Park, where you will witness large herds of elephants at the river. And last but not least you will visit the breath-taking Victoria Falls in Zimbabwe. All the lodges, guesthouses and camps used in this itinerary have been visited by us personally and can therefore be recommended at first hand. We prefer not to make use of big impersonal lodges, hotels and resorts but instead we include owner-managed guesthouses and private lodges in our itineraries. We believe that in doing so, we give you the chance to interact with the local staff and owners where you get to learn more about the places and points of interest you are visiting. Upon your arrival at Windhoek International Airport, you will pick up your rental car and head to the Casa Piccolo, where you will spend your first night. There are no plans for the rest of the day and you can either just relax after a long flight or visit one of the places of interest. Why not stop by the National Gallery where the work of local artists is on display or visit the National Museum that will provide you with interesting facts on Namibia’s history. Enjoy a hearty breakfast before you leave Namibia’s capital in a southerly direction. Via Rehoboth and the Remshoogte Pass you make your way to Sesriem, the gateway to the dunes of Sossusvlei. Enjoy an amazing play of light and shadow while the sun sets before you make your way to the Desert Camp, where you will spend the night. You can either cater for your own meals or head over to the Sossusvlei Lodge for breakfast and dinner (should you wish, accommodation can be pre-booked on half-board basis). You will make your way into Sossuvlei at sunrise. Park your vehicle and walk into the dunes or make use of a 4×4 transfer. Some of the dunes reach a height of almost 300 metres and it’s definitely worth hiking to the top of them to enjoy the beautiful views over the entire landscape. From here it’s on to the Sesriem Canyon, where hikes are also possible in dry season. 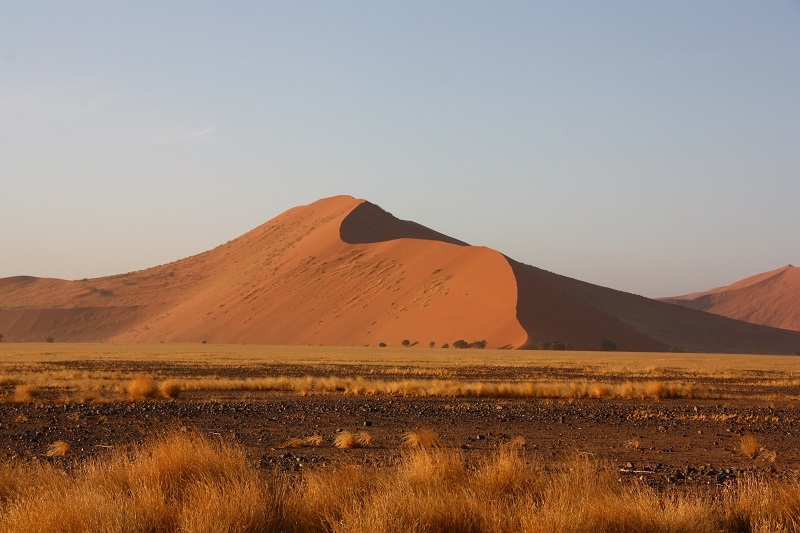 You also have the opportunity to book a guided desert walk at the Sossusvlei Lodge should you be interested in learning more about the desert. You will spend another night at the Desert Camp. Today’s destination is Swakopmund, home to many descendants of late colonists and state officials of the German colonial era. With everything from German cake to the German architecture of the old station and the old court house and the ever present German language, you will be constantly reminded of the olden days. But Swakopmund is much more than that and there are numerous activities that can be done from here (e.g. daytrip to Cape Cross or sandboarding in the dunes and many more). You will spend the next two nights at the Cornerstone Guesthouse and during your stay you will have time to give one or two of the nearby restaurants a try. After breakfast your journey takes you via Outjo (don’t forget to stop at the German bakery for some goodies for the road) to the Vreugde Guest Farm. It is here where you are given an insight into the daily life of a typical Namibian farm and where you will enjoy some good old “south-western style” meals. This idyllic farm is the perfect stop en-route to the famous Etosha National Park and you will certainly enjoy a peaceful stay when you overnight at the Vreugde Guest Farm. 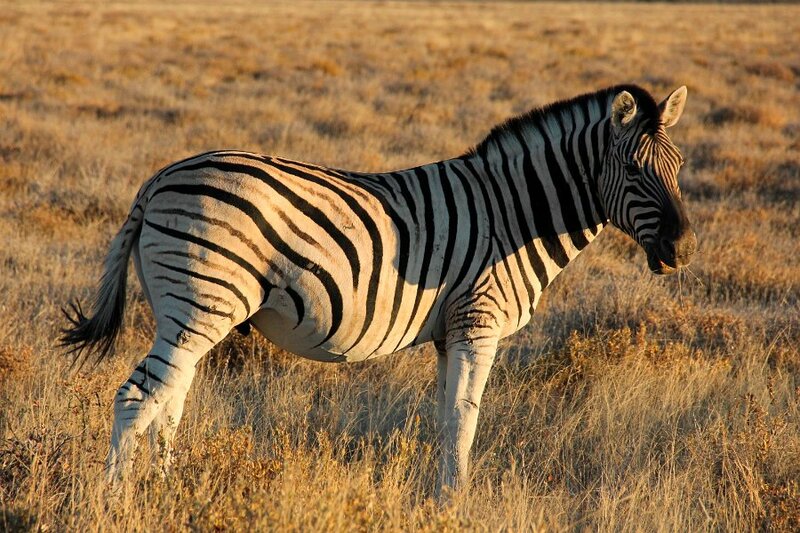 After breakfast you leave Vreugde Guest Farm behind to continue your journey to the well-known Etosha National Park. At the Anderson Gate, you enter the park which was founded in 1907 and is one of the most beautiful parks in Southern Africa. You will be staying at the Okaukuejo Rest Camp, which is the ideal base for game drives to the western and central part of the national park. You will spend the next two days game viewing and waiting patiently at waterholes to spot a variety of animals such as elephants, rhinos, giraffes and numerous antelopes. 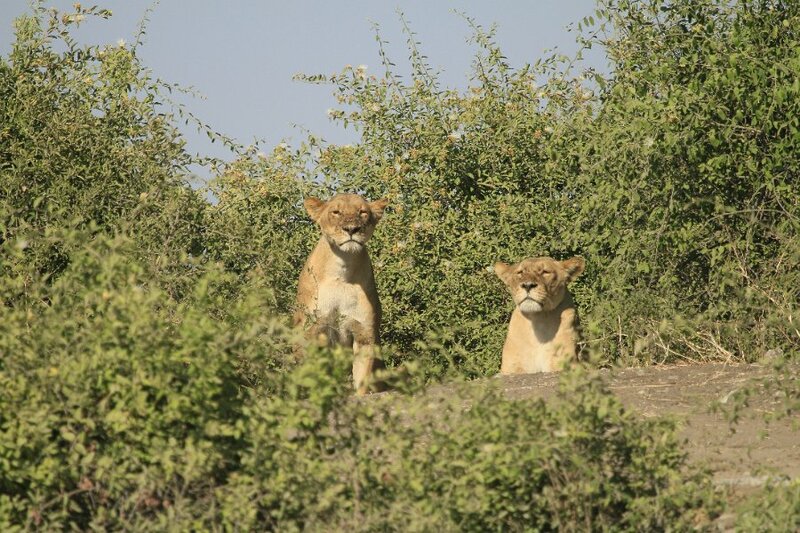 If you are lucky you might get to see predators such as lions and leopards. You also have the possibility to book a night game drive at the camp (optional and not included in the price). Overnight at the Okaukuejo Rest Camp. The rest camps in the Etosha National Park are government owned institutions and even though they underwent considerable improvements to celebrate the 100th birthday of the park in 2007, one should not forget that they are maintained by the state who’s standards are not always up to scratch. Nevertheless the accommodation is generally clean but under no circumstances luxurious. Should you be interested in staying in more luxurious accommodations, please feel free to let us know as there are plenty of such accommodations on the outskirts of the national park. Enjoy breakfast while the sun rises over the horizon before you head out for some more game viewing. 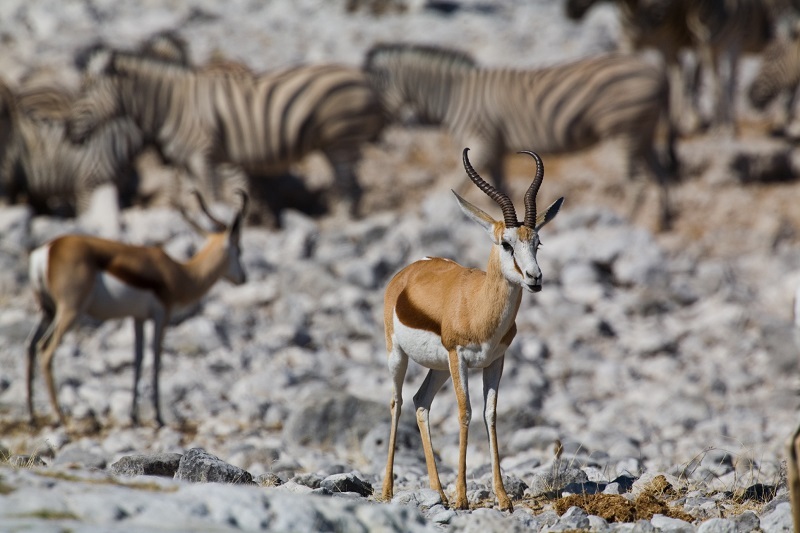 Today’s journey takes you along the salt pans that reach far into the east and it is here where you will be able to spot impala, gnu, oryx and zebra herds that cut across the Etosha National Park. In the evening you will leave the park through the Van Lindequist Gate to make your way to the Mushara Bush Camp, where you will spend the night. After breakfast you will travel past Tsumeb and Rundu on your way to the Caprivi Strip. This part of Namibia was acquired by Chancellor Leo van Caprivi who arranged it to be annexed to “German South-West Africa” in 1890 to allow Germany access to the Zambezi River and “German East Africa”. Due to the everlasting conflicts between the borders of Namibia, Angola and Botswana, the region was long deemed unsafe for tourists. Thankfully that era is over and today visitors from near and far enjoy travelling through this very attractive region of Namibia. You will be making your way to the Nunda Safari Lodge that is situated on the shores of the Kavango River. After you have spent the last few days in mostly very desert like regions, you will enjoy the succulent and lush scenery that expects you here. The following day is set aside for some activities and you can either enjoy a boat trip on the Okavango River or join a 4×4 guided tour to the Mahango Game Reserve or visit a local village to learn more about the inhabitants and their way of life. You will spend the night in a luxury tent at the Nunda Safari Lodge. Enjoy breakfast before you cross the border to Botswana where you make your way to Maun, passing Etsha and Sehitwa along the pan-handle. There are no activities planned for the afternoon and you can either just unwind at the lodge or wander around the centre of town. You will spend the night at the Thamalakane River Lodge that finds itself on the banks of the Thamalakane River. An exciting journey awaits you today and you park your car at Maun airport to board a light-aircraft. 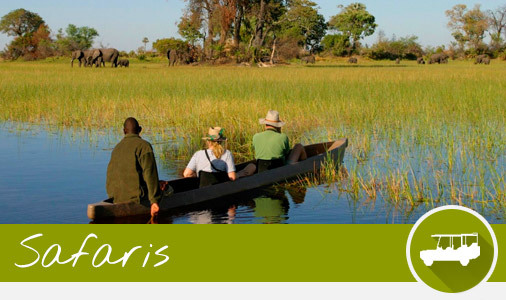 Your destination is the Okavango Delta and in flight you can enjoy the spectacular views of Africa’s largest inland delta. The Okavango Delta is not only home to a vast variety of wildlife such as antelopes, elephants, wild dogs, lions and many more but it is also a haven for many different bird species. During your time in the Okavango Delta you will enjoy different activities including mokoro excursions, bush walks, game drives and night game drives. You will spend two nights at the Pom Pom Camp (including all above mentioned activities). With lasting memories you leave behind the Okavango Delta and on your flight back to Maun you can enjoy the breath-taking views of the delta one last time. The night will once more be spent at the Thamalakane River Lodge. Today’s destination is Nata where you will be staying at the Nata Lodge, the gateway for excursions to the Nata Bird Sanctuary and the Sua and Ntwtwe Pans (by 4×4 or guided tour only). Endless and enormous salt pans, lush pastures and immemorial baobab trees are home to many sanctuaries well worth seeing. Join a guided tour (departs around lunchtime) into the pans and if you are fortunate you will spot pelicans and flamingos. After breakfast you once again hit the road and travel north to Kasane. After you have checked-in at the Bakwena Lodge you will return your rental car at the rental location in Kasane (depending on the car rental company, your vehicle may also be picked up at the lodge). 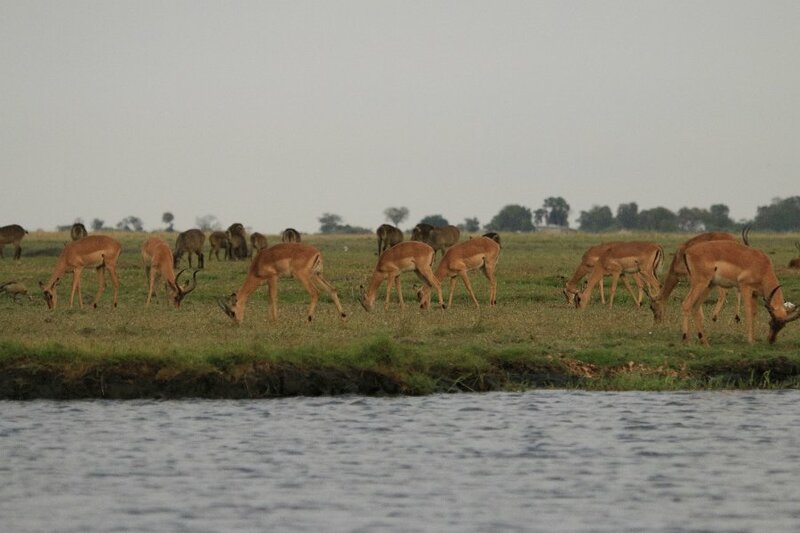 Your stay at Bakwena Lodge includes game drives to the Chobe National Park as well as river cruises on the Chobe River and the national park entrance fees. The Chobe National Park is home to more than 40.000 elephants, making it one Africa’s places with the highest density of elephants. 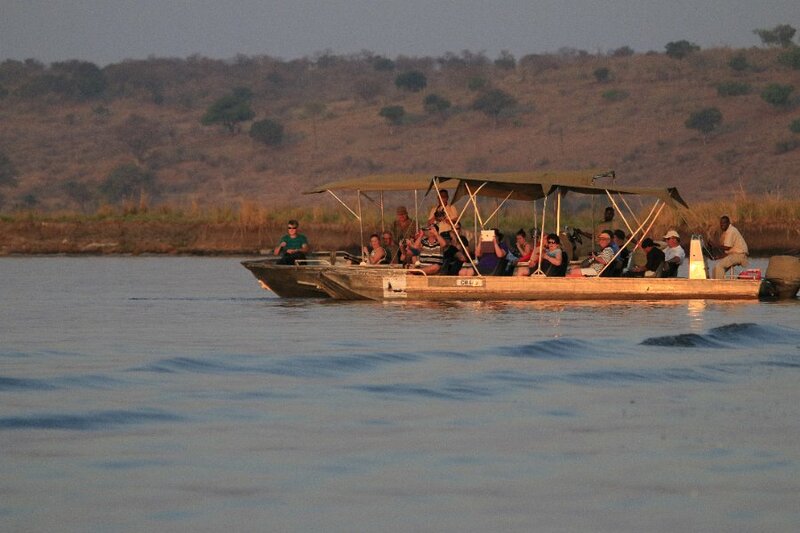 In the afternoon you will hopefully get to see crocodiles, hippos and elephants during a river cruise. In the evening you will leave the park to spend the night at the Bakwena Lodge. You will be up at sunrise the next morning to join a 4×4 game drive in the park when you will hopefully see elephants flocking to the river to drink. After you have enjoyed a morning game drive in Chobe National Park, you are picked up at the Bakwena Lodge for you transfer to Victoria Falls. You will spend two nights at the Ilala Lodge, situated in close proximity to the Victoria Falls itself. The falls are also known as ‘Mosi oa Tunya’ that translates to smoke that thunders. 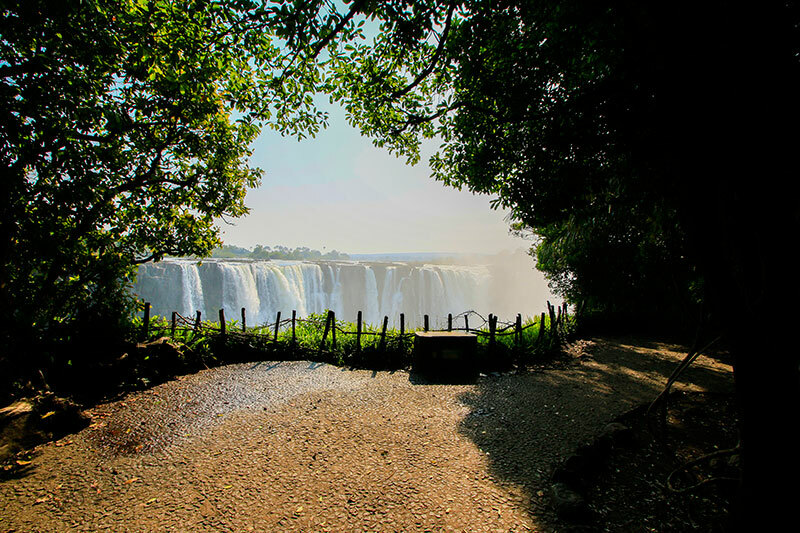 The region is well-known for the numerous activities on offer and you can either take it easy while strolling along the falls or enjoying a sunset boat cruise on the Zambezi River or being a bit more adventurous while flying over the falls in a micro-light aircraft, going bungee jumping or white water rafting. After breakfast you are taken back to Victoria Falls Airport from where you embark on your homeward journey.